Yippee! Reading with Your Kids is EXCITED to announce that “Daddy’s Little Princess” by Steve Proutsos has earned the Reading With Your Kids Certified Great Read Status for the month of January and we can’t get any happier to share this little gem of a book with all our listeners. The Reading With Your Kids Certified Great Read designation has been developed to acknowledge outstanding books and products that kids and parents will love to experience together. 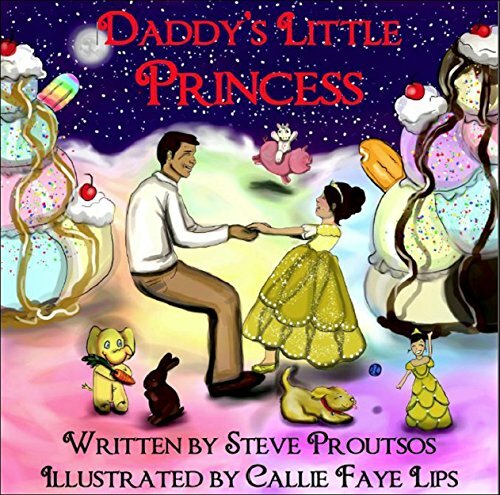 Congratulations to Steve Proutsos for winning RWYK Certified Great Read Status for Daddy’s Little Princess! Daddy’s Little Princess is about a beautiful relationship between father and daughter. It shows how a first time dad grows to become a confident and loving father and how a little girl, with the help of her dad, overcomes her fears and becomes a responsible, confident young woman. The story takes places through eight nights during certain ages of the daughter’s life where she is scared to go to bed. In infant and toddler stages, she is frightened to be alone, but in the later stages, she is afraid of what is to come in her life. Her dad comes in her room to help her conquer her fears and show her how much he loves and cares for her. After each night, the daughter has extraordinary dreams that helps her conquer her fear at that moment. Her father’s hopes are for her to grow up to be an independent and responsible young woman, but also know that he will always be there for her no matter what. Steve Proutsos is an English teacher at Lincoln-Way High School District 210. He enjoys teaching, writing, coaching, and spending as much time as possible with his wife and three daughters. He grew up in Palos Heights, Illinois and is the oldest of three children. He played basketball and baseball throughout his adolescent years. He started teaching in the fall of 2005 at Lincoln-Way Central High School and coached baseball, basketball, and track. He grew up a Chicago Cubs fan and loves to go to the ballpark with his wife and his three daughters. every time he and his wife held their three daughters for the very first time, but those three experiences not only solidified some of the most beautiful memories he will ever have, but it also helped him realize that writing about love, hope, perseverance, and family is now part of his life. When Steve gets older, he hopes to instill in his daughters the love, knowledge, and aspirations that his parents and grandparents have done for him throughout his life. Steve now resides in Tinley Park, Illinois with his wife Colleen, his three daughters, Hailey, Emily, and Lily, and their fun-loving yellow Labrador, Wrigley. Sweet and simple! A great night time book for a dad to read to his little princesses, with cute pictures. There’s something truly special about the bond between fathers and daughters and Daddy’s Little Princess is a perfect portrayal of this amazing bond. It’s a lovely, touching and a heartwarming look at the special relationship between a father and a daughter written by Steve Proutsos and illustrated by Callie Faye Lips. This book can be a perfect gift book or story to celebrate father’s day. I love how charming illustrations compliment this perfectly simple book. The detailed action in the pictures can be observed closer and talked about between parents and a child providing an engaging read. I really enjoyed reading this book as it describes the journey of a father and daughter from the moment she is born to the time she is all grown up and gets married. And as their journey unfolds, they share all sorts of affectionate, happy moments. This book covers all sort of situations where a daughter is afraid to take some important steps in her life thinking she would fail and her father will no longer be proud of her however her father ensures her that he will always be a proud father and promises that she will always be his little princess no matter how old she gets. I found this book to be very engaging with the large print and colorful illustrations. It also stands out because there are not a lot of books out there that talk about fathers, especially for younger students. I think this will allow small children to understand and explore the importance of their fathers and or male figures. A cute, short book that will keep the younger children entertained. Highly recommend not just for kids but for people of all ages to experience the amazing bond this Father-Daughter duo shares in Daddy’s Little Princess! A big thank you to author Steve Proutsos for providing us a free copy of this book through Reading with your Kids certified program. The opinions expressed in this review are entirely our own.